this is the second year I have been fortunate to take part in the Try It On promotion by Brooks where they let you have a pair of shoes to trial for a week. I am a big fan of Brooks shoes. 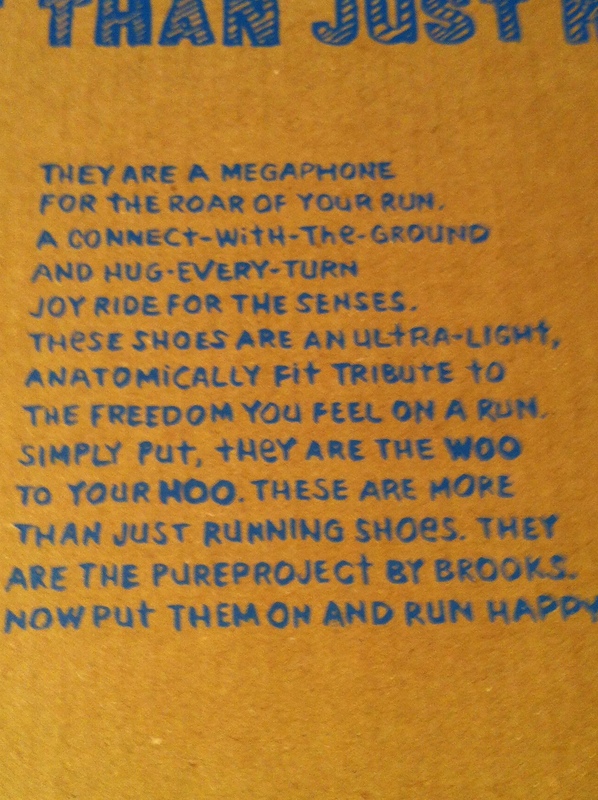 Most of my running shoes are Brooks. I have been running in the Pure range of shoes pretty much since they were launched. My favourite Pure Project shoe remains the original Pure Grit trail shoe. Despite the fact the grip on the sole wasn’t great, as a shoe, for fit, feel and comfort it was pretty much perfect. Last year’s update to version 2 of the Pure shoes didn’t work so well for me. 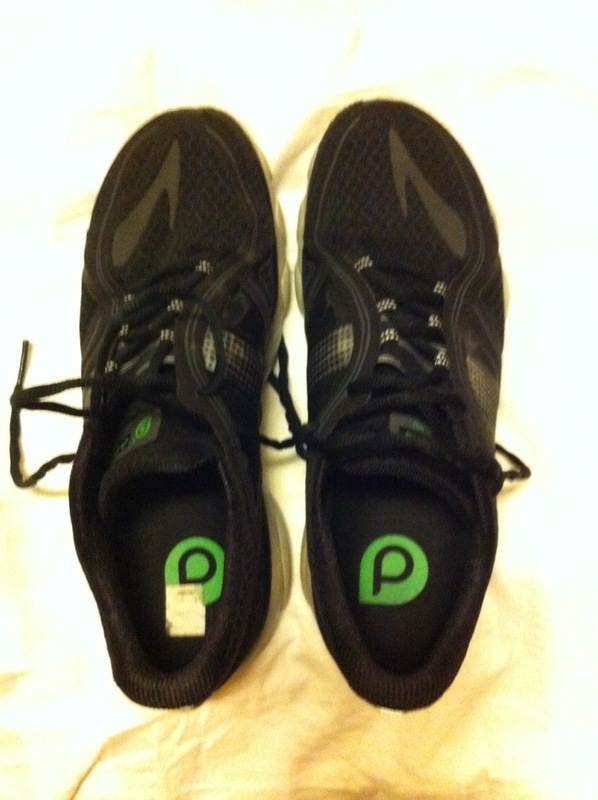 I bought a pair of Pure Cadence 2 but they just didn’t feel as good as the version 1 shoes. 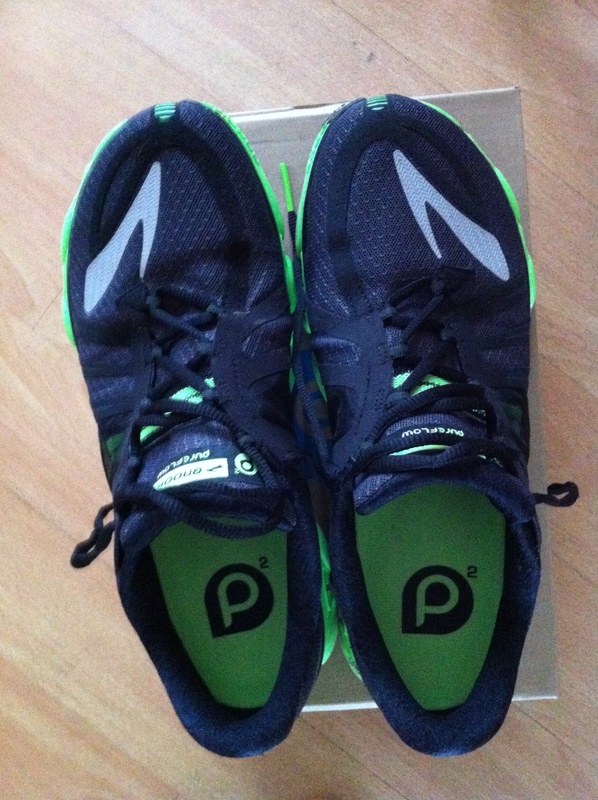 I tried the Pure Flow 2 as part of Brooks’ Try It On promotion and just couldn’t love them. They were too big, too soft and the upper rubbed my little toe. I blogged about them here. 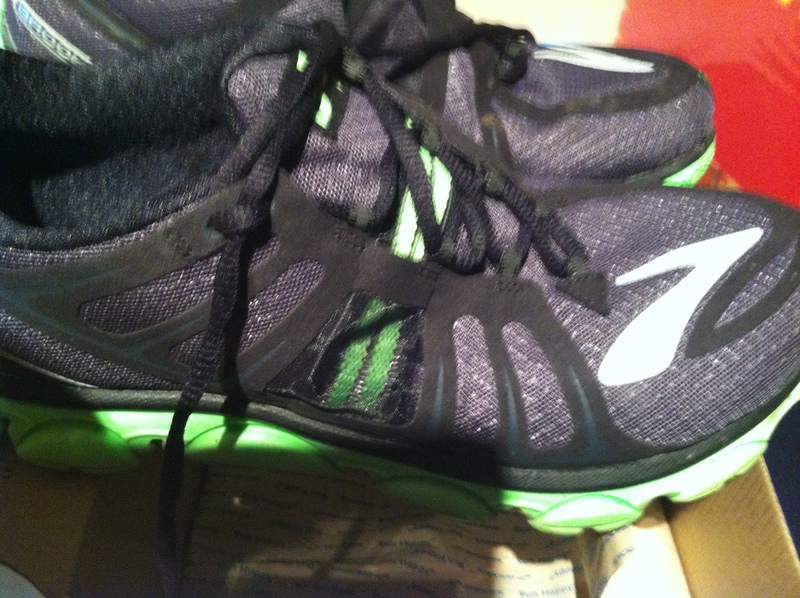 I have been running in a pair of Pure Flow 3 for the past week as part of this year’s Brooks Try it On Promotion. This year’s model feels much improved. These shoes are immediately comfortable and you can run in them straight out the box. 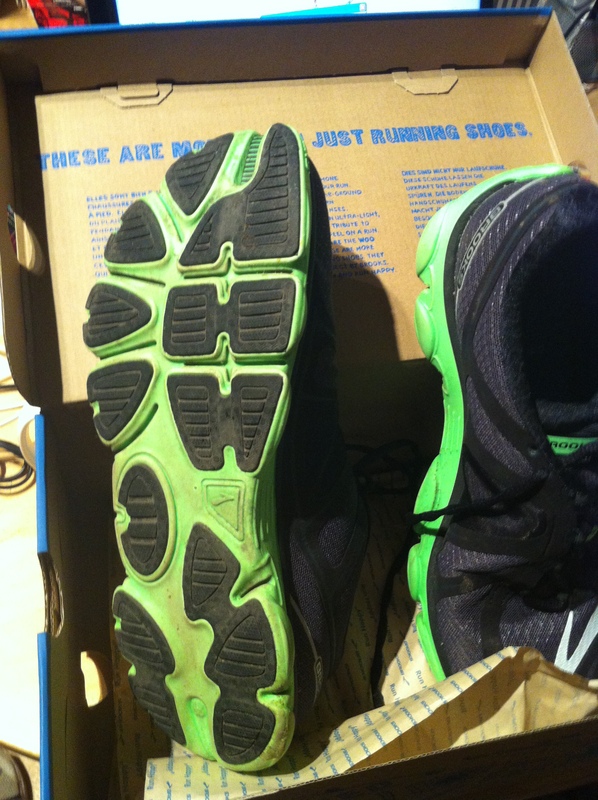 The ride feels lower and while there is plenty of cushioning, it is a very responsive shoe. There is plenty of cushioning to support my heavier frame. The shoe feels very well balanced. It nudges you towards a midfoot/forefoot strike rather than pushes you. The shoe is very flexible, allowing you to run fast, but still manages to feel substantial enough to protect you from the pavement. It doesn’t feel too dissimilar to my beloved Racer ST5’s which are my preferred marathon race shoe. After only a week’s running in them I am pretty confident that I could happily run a marathon in these shoes and be happy wearing them. The fit is comfortable. The toe box is wide enough for my wide feet, without feeling too large. There isn’t too much excess volume on the top of the shoe. The fabric is soft and comfortable and hugs your foot very nicely. The heel is comfortably snug and doesnt rub. 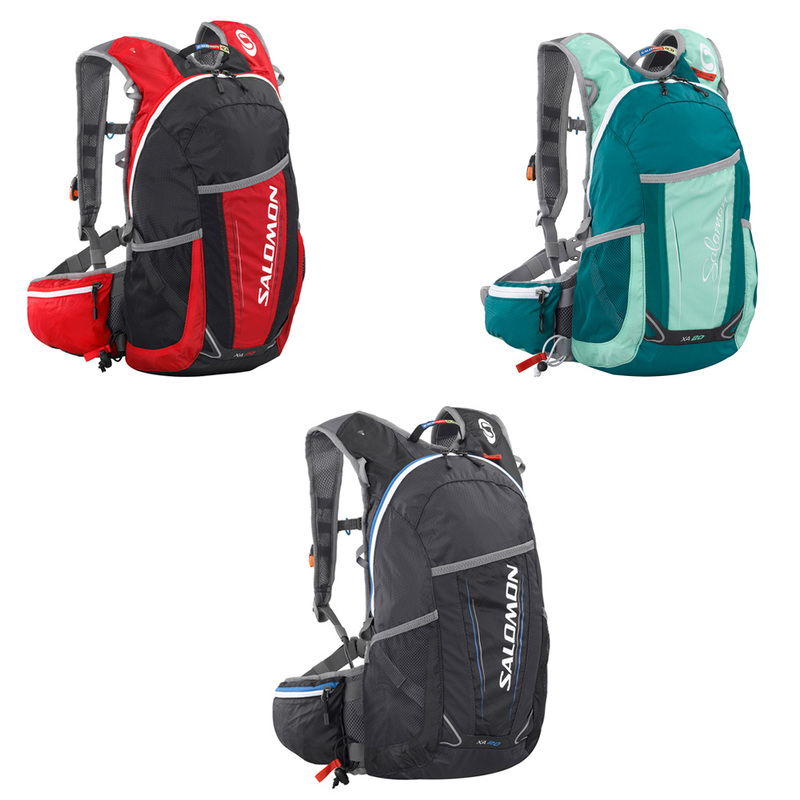 The asymmetric lacing has changed shape and is much more comfotable. The previous version tended to put pressure on the top of my foot (I have high arches) whereas the different shape is very comfortable. The tongue is stitched in place on the inside which again helps to keep the foot secure and in place. I am still not convinced that either the Nav Band or the split toe add much to the shoe, but then again the shoe works very well so who am I to argue. All in all there is very little more to say about these shoes. They are probably the best shoe I have tried for a long time and a shoe which I would be confident wearing for long distances and which are a significant improvement on the Pure Flow 2. I will almost certainly part with my hard earned cash to buy a pair as I can see them becoming my workhorse marathon training shoe. I am a big fan of Brooks shoes. Firstly they fit my feet and secondly they have some nice technologies in their shoes. 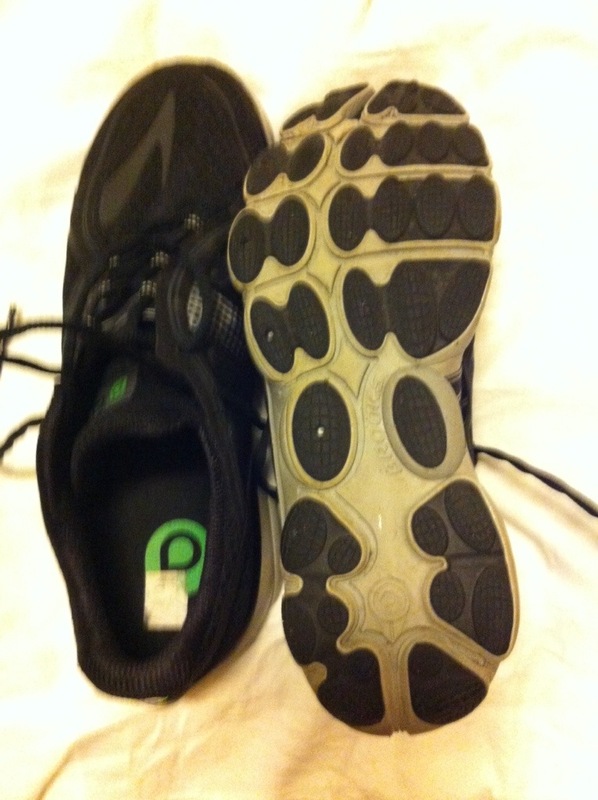 I have previously worn two different Pure Project shoes, the Cadence and the Pure Grit. 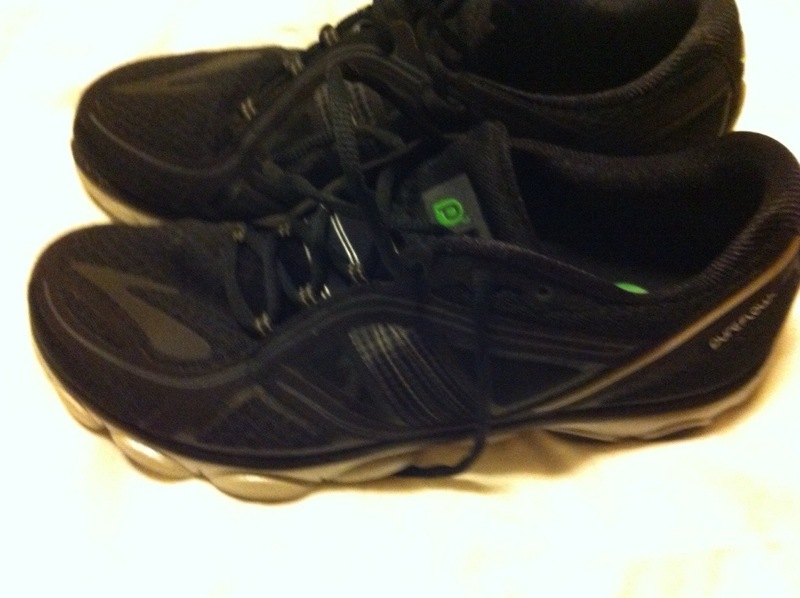 The Cadence is a very nice shoe, extremely comfortable and so far has done me for more than 400 miles. The Pure Grit is an equally comfortable shoe, and is a shoe I would willingly wear for many many miles. I was keen to try the Pure Flow because I was looking for a shoe for my next marathon, I am comfortable in the lower heel drop shoes and had read many good reports of the Flow. The chance to get a pair to try was too good to pass up. My initial impression of these shoes was one of disappointment. When I put them on, after the carpet slipper like sensation of the Cadence, they just didnt feel right. They pinched my right foot and my little toe pressed against the slightly hard edge of the toe box. My first run in these was on the treadmill and again slighlty disappointing. My toes went a bit numb, I got a hot spot on the ball of my foot and the heel cup felt hard and stiff as did the toe box. Oh and I didn’t think they were very pretty! I was prepared to give them a chance, so wore them for a fast 10 mile run at the weekend. Again, I just couldnt feel the love for them. The still pinched my right foot, and they felt like they were wearing long, so that there was an extra unused bit of shoe like a flipper at the front of the toe. They weren’t so bad, but I wasn’t impressed. I also felt like the sole of the shoe was very wide compared to the upper and so were a bit like clown shoes. This was accentuated by the bright green rubber of the midsole. For my next run, I decided to lace them differently, using the loop lace technique to hold my foot in the heel. This was an improvement. On balance I don’t think I am a fan of the asymmetric laces. I find that the top inside eyelet creates a pressure point on the inside of my arch ( I have quite high arches). The same thing happens with a pair of Green Silence that I own. On the verge of giving up, I remembered reading something on either Runblogger.com or RunningShoesGuru about the thickness of the insole causing a problem. 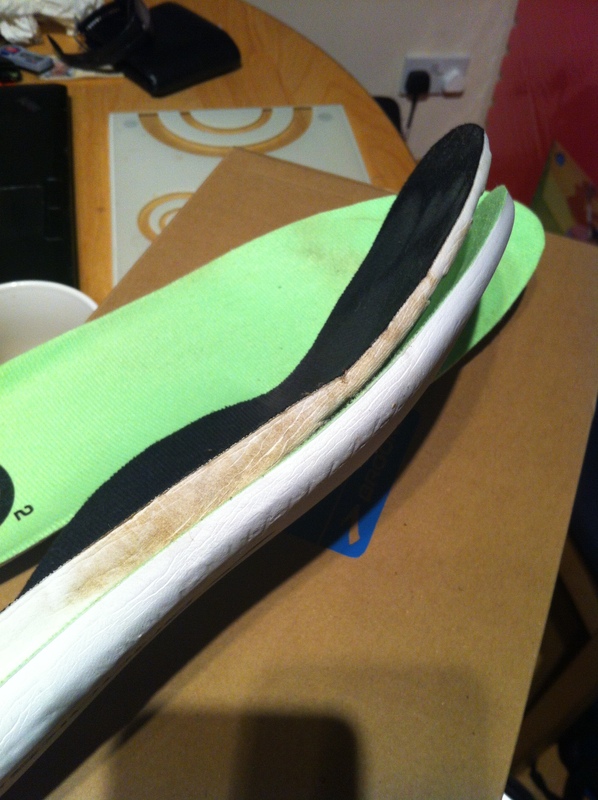 Following their tip I removed the Pure insole and replaced it with the much thinner insole from my Brooks ST5 shoes. The difference was instant. My foot splayed correctly across the full width of the shoe and the extra few millimetres volume in the toe box made them much more comfortable. I took them for a steady 3 mile run and they were like a different shoe. They didn’t have the slightly spongy feel they had had previously. Instead they felt quite responsive, but with enough cushioning to feel comfortable. Had this been my day 1 experience I would have been saying this is a nice shoe! The fabric is a slightly more robust fabric than that used in the Cadence which will probably make them more water resistant at the expense of that luxuriant feeling. The big Brooks flash on the front of the shoe doesn’t look very good, but it is a super effective reflector which makes you really visible to oncoming traffic in the dark. The other Pure features – the Navband and the split toe don’t seem to have any significant effect as far as I can see, though the Navband does seem tighter and more effective than in the first models. I was really surprised that I was struggling with these shoes, but a little bit of research uncovered quite a few similar reviews with runners finding the new Flow 2 a little narrow and long, so maybe its not just me! Overall, I am not sure they are the shoe for me. They are nice and flexible though a little soft under foot for my taste, but for runners who like a lot of cushioning they would be ideal. 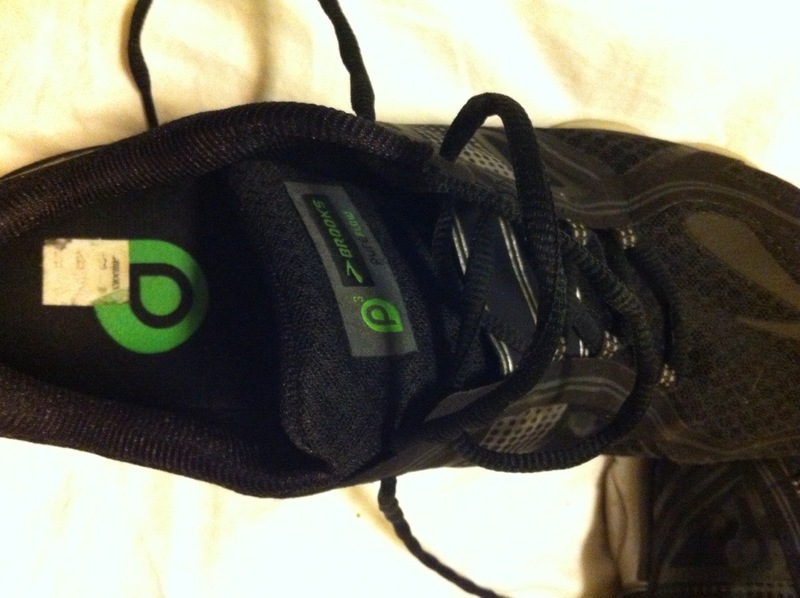 By changing the insoles I could use them as a long distance road shoe and be quite happy with them. I might wear them for long runs instead of my Ghosts which are well cushioned but a little stiff. Overall, if the shoe fits your foot this is probably a very good shoe, but for me I was just a wee bit disappointed that it wasn’t as good as I hoped it would be.